More than one out of five auto accidents in the United States is weather related, most commonly caused by rain, snow, sleet, or ice.1 Colder areas of the country can be hit by all of these conditions, sometimes in the course of a single day. And even milder regions may see heavy rain. No matter where you live, winter can be a dangerous time on the road. Before you drive in challenging weather conditions, be sure you have appropriate insurance and take precautions to help keep yourself and your passengers safe. Collision insurance covers damage to your car resulting from a collision with another automobile or an object, regardless of whether you are at fault, up to policy limits. (If you are in an accident where another insured driver is at fault, your insurance company may try to recover costs from the other driver’s insurance provider.) Collision insurance also typically covers damage from potholes — a common winter nuisance as frozen streets thaw and freeze again. The specific coverage for potholes may vary from company to company. Even if your car is parked, winter can pose dangers — for example, damage from a tree limb broken under the weight of snow, a chunk of ice falling from an overpass, or a hailstorm. Damage from these types of events is usually covered under the comprehensive portion of your automobile insurance policy. Comprehensive insurance covers loss (up to policy limits) resulting from theft or damage caused by something other than a collision with a car or object, including fire, vandalism, a cracked windshield, or running into an animal such as a deer. Some policies offer auto glass coverage without a deductible. Being especially cautious while driving during the winter is common sense, but here are some tips that might be helpful. Keep your windshield and windows clear. Never drive until your windshield is fully defrosted. Replace worn windshield wipers. Keep a snow brush or scraper onboard during the cold months, and remove accumulated snow from windows and the car’s body before driving. Check your tire treads and keep your tires properly inflated. 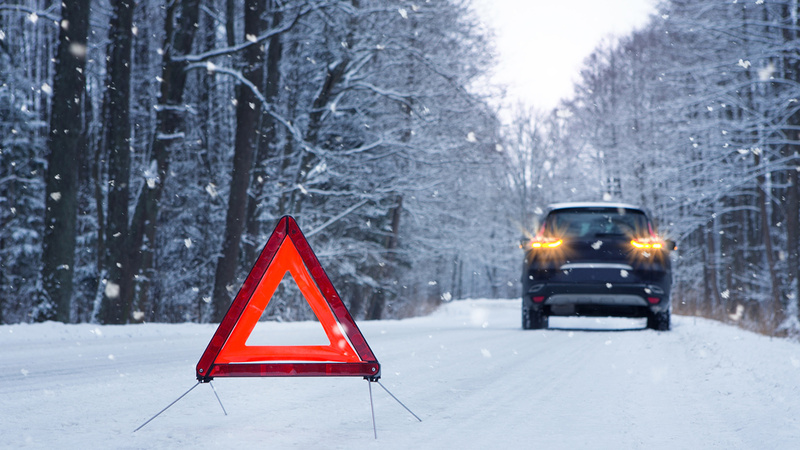 Carry tire chains if you are driving in a situation where they might be required. Contact your local highway authority for information about road closures and tire-chain requirements. Do not warm up your vehicle in an enclosed area such as a garage. Check your exhaust pipe to make sure it’s clear. A full tank of gas could help keep your gas line from freezing and ensure that you don’t run out of fuel if you encounter weather-related delays or detours. Bring a charged cell phone and prepare a winter survival kit to keep in your trunk in case you are stranded and need to wait for assistance. You should always carry a flashlight and jumper cables, and warning devices such as flares or cones may be helpful in any weather. For winter, add blankets and abrasive material such as sand, salt, gravel, or kitty litter. On a long trip, be sure to take food, water, and medications. Avoid driving during major storms and hazardous conditions whenever possible. If you must drive, allow extra time to arrive at your destination. Turn on your lights to increase visibility, drive slowly, and keep a safe distance between you and the auto in front of you — it takes longer to stop, turn, and accelerate on wet, icy, or snowy roads. Take special care when driving over bridges or in heavily shaded areas where the road may be icy even if other areas are not. Don’t assume your vehicle can handle all conditions; even four-wheel-drive and front-wheel-drive autos can encounter problems on snowy and icy roads. If you get stuck in snow or ice, don’t spin your tires. Turn wheels from side to side several times to push the snow out from under the tires and apply a light touch on the accelerator. Use a shovel to clear snow from around the tires first, or pour abrasive material in the wheels’ pathway to create traction. If you don’t have abrasive material, try using your floor mats flipped upside down. If you are stopped, stuck, or stalled, don’t overexert yourself. Stay in your car until help arrives. Use flares or cones if you have them; put bright markers on the antenna or windows and turn on the dome light. Make sure your exhaust pipe is clear and run your car just enough to stay warm. Winter can be a challenging time of year to drive. By taking precautions and carrying appropriate coverage, you could help make it a safer, more secure driving season.